St Werburgh's at Warburton (sometimes called St Werburgh's Old Church) is a unique medieval survivor, one of only 27 known timber-framed churches in England. It stands beside the Manchester Ship Canal, and despite the fact that it is close to the M6, it is still a peaceful location. 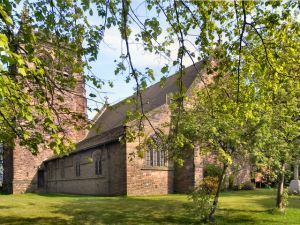 The church was probably erected in the 12th or early 13th century but was almost totally rebuilt in the early 17th century. The exterior gives little clue as to what lies within; it is a combination of stone and brick, with an early Georgian tower and an intriguing 'hearse house' (which is exactly what it sounds like; a shed for storing an undertaker's hearse). The interior is a historic gem; the highlight is the structure of the building itself. The roof is supported on rough timber posts rather than the usual stone pillars. There is lovely Jacobean woodwork in the pulpit and communion rails. There is an octagonal font, inscribed with the date 1603 and the words 'William Drinkwater the Keeper'. The pews might appear of a similar age, but they are, in fact, early 19th century additions. There are also several 12th century stone coffins, probably used for priors of the Premonstratensian abbey which once stood next to St Werburgh's. This delightful ancient church is no longer in regular use, which seems a real shame. It is cared for by the Churches Conservation Trust, and we must be thankful that they have seen fit to preserve this piece of English heritage for us to enjoy.